In 2015, we organised excursions to 13 different sites - the majority proposed Local Biodiversity Sites (pLBS). 68 individuals attended these events and 3984 species records for 34 different taxonomic groups have been submitted to TWIC - an average of 306 records per site. Thank you to everyone who attended and especially the following who led excursions in 2015: Reuben Singleton, Jackie Muscott, Peter Leach, Liz Lavery, Sarah Eno, Colin Legg, Michael Scott, David Chamberlain, Luke Gaskell and Barbara Sumner. This was a joint meeting with the Lothians and Borders Mammal Group (LaBMaG). Vascular plants, bryophytes, lichens, fungi, mammals, birds and a few insects. 9 mammal species recorded, including two species in the Longworth traps (Bank Vole and Wood Mouse). Also found was Great Horsetail (Equisetum telmateia), an uncommon species in Scotland. Small mammal trapping in Pease Dean. 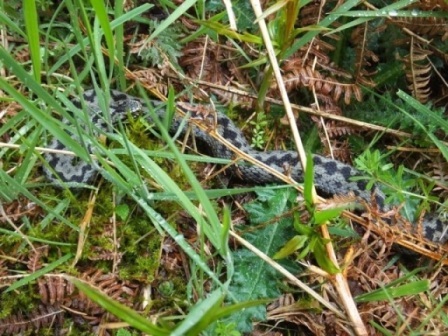 Adder (Vipera berus). Photograph courtesy of Ron McBeath. Vascular plants, bryophytes, fungi, mammals, birds, reptiles, moths and a few other insects. Adder (Vipera berus), Pine Marten (Martes martes) signs, Scarce Prominent moth (Odontosia carmelita) and Cuckoo (Cuculus canorus). Vascular plants of most interest were Oak Fern (Gymnocarpium dryopteris) and Juniper (Juniperus communis). Vascular plants, birds, bryophytes, molluscs, mammals, butterflies, fungi and a few other insects. Two locally rare plants, Broad-leaved Helleborine (Epipactis helleborine) and Common Wintergreen (Pyrola minor). 28 species of birds were recorded, including Chiffchaff, Willow Warbler, Whitethroat and Garden Warbler. We also had excellent close views of Swifts, Swallows and both House and Sand Martins along the Breich Water. The longworth traps produced a single Wood Mouse. 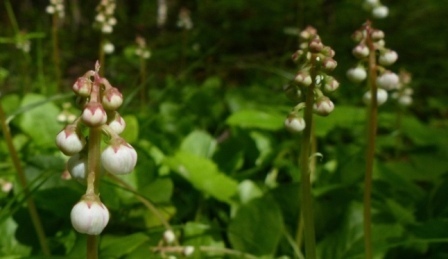 Common Wintergreen (Pyrola minor). Photograph courtesy of Mike Beard. Common Toad (Bufo bufo). Photograph courtesy of Mike Beard. 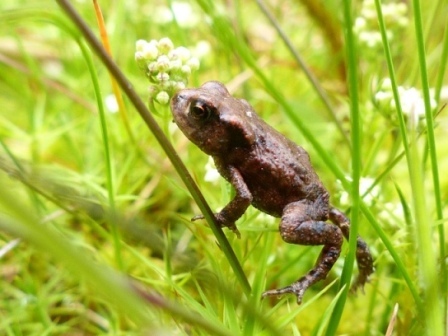 Joint meeting with the Lothians Amphibian and Reptile Group (LARG). Vascular plants, bryophytes, lichens, fungi, birds, amphibians, fish, mammals, dragonflies, beetles, true bugs, molluscs and a few other invertebrates. 3 species of amphibians recorded (Common Toad Bufo bufo, Common Frog Rana temporaria and Palmate Newt Lissotriton helveticus) and 6 species of dragonfly (Odonata). Vascular plants, birds, bryophytes, butterflies, mammals and bees. At Glenochil Bing Wood we found a single plant of Hairy Buttercup (Ranunculus sardous), which is the 3rd site for the species in West Perthshire VC87. We also found Warty-cabbage (Bunias orientalis) en route to the woodland, which is known from only two sites in VC87 West Perthshire. At Alloa New Marshalling Yards the highlights were Broad-leaved Helleborine (Epipactis helleborine), Common Twayblade (Listera ovata) and Common Wintergreen (Pyrola minor) - the latter being quite abundant in the ground flora. Hairy Buttercup (Ranunculus sardous). Photograph courtesy of Liz Lavery. 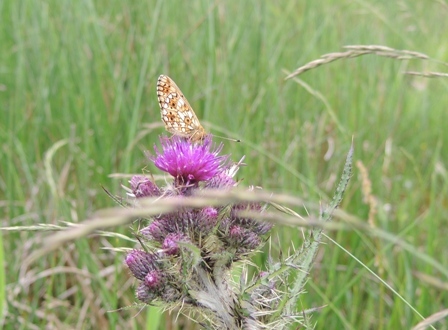 Small Pearl-bordered Fritillary butterfly at Fingland Burn. Photograph courtesy of David Long. Vascular plants, bryophytes and butterflies. 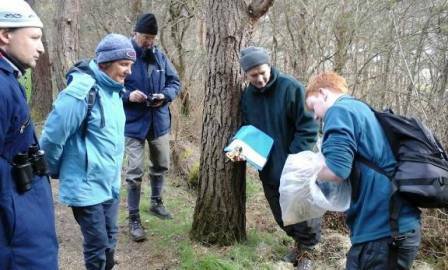 100 bryophytes recorded. 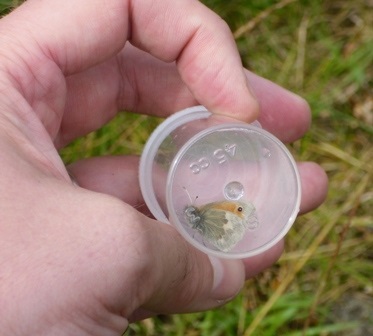 The group also spotted Small Pearl-bordered Fritillary butterfly, Boloria selene - a new site for the species - and it was noted that its food plant (Viola palustris) was particularly abundant. Botanical highlights included: Mountain Male-fern (Dryopteris oreades), Marsh Stitchwort (Stellaria palustris) and Squirreltail Fescue (Vulpia bromoides). Vascular plants, bryophytes, spiders, birds, butterflies, flies, moths, bees, grasshoppers, mammals and a few other insects. Botanical highlights were Wood Bitter-vetch (Vicia orobus), Mountain Everlasting (Antennaria dioica) and Cowberry (Vaccinium vitis-idaea). The group also spotted a Mountain bumble Bee (Bombus (Pyrobombus) monticola). Small Heath butterfly (Coenonympha pamphilus). Photograph courtesy of Mike Beard. 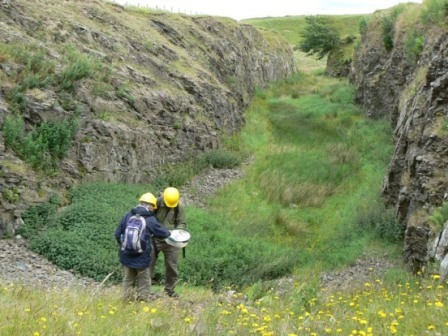 Inverterbrate surveying in the quarry at Tofts Hill. Photograph courtesy of Natalie Harmsworth. Vascular plants, butterflies, bryophytes, birds and mammals. Botanical highlights included abundant Lesser Tussock-sedge (Carex diandra) at the pond and Least Bur-reed (Sparganium natans) - a species that is very local in Roxburghshire. Eggs of the UK Biodiversity Action Plan Priority Species Northern Brown Argus butterfly (Aricia artaxerxes) were found on Common Rock-rose (Helianthemum nummularium). Vascular plants, bryophytes, birds, moths, butterflies, dragonflies, amphibians, beetles and mammals. 59 bryophytes including 11 species of Sphagnum. We also found the local rarities Tea-leaved Willow (Salix phylicifolia) and Cranberry (Vaccinium oxycoccos). 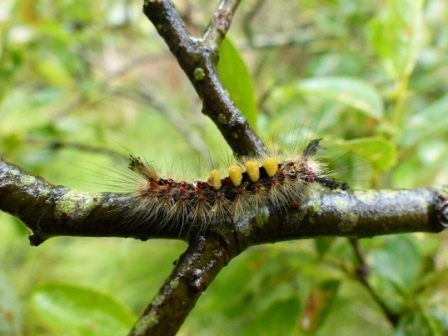 Vapourer moth caterpillar (Orgyia antiqua). Photograph courtesy of Mike Beard. 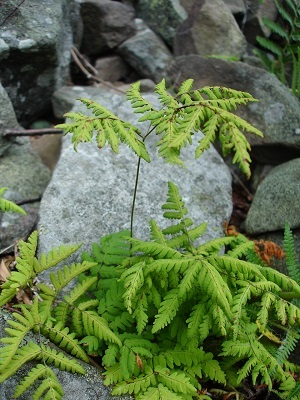 Oak Fern (Gymnocarpium dryopteris). Photograph courtesy of Yvonne Arnsdorf. Highlights included Lesser Clubmoss (Selaginella selaginoides), Juniper (Juniperus communis), Mountain Male-fern (Dryopteris oreades), Oak Fern (Gymnocarpium dryopteris), Dioecious Sedge (Carex dioica), Pale Sedge (Carex pallescens), Limestone Bedstraw (Galium sterneri), Pale Forget-me-not (Myosotis stolonifera), Grass-of-Parnassus (Parnassia palustris) and Starry Saxifrage (Saxifraga stellaris). This was a joint excursion with the Botanical Society of Scotland (BSS) to tie in with their Urban flora of Scotland project. Vascular plants, bryophytes, birds, butterflies, fungi and bees. 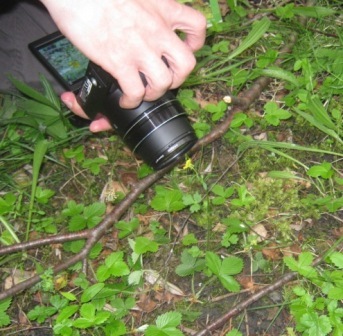 163 vascular plants were recorded. 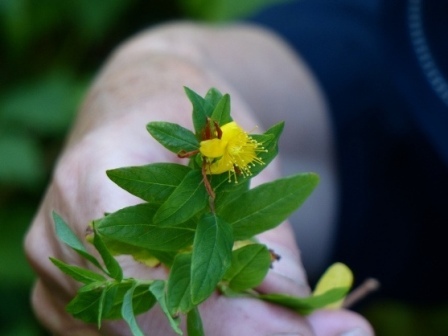 Botanical highlights included Des Etangs' St John's-wort (Hypericum x desetangsii), Turkish Tutsan (Hypericum xylosteifolium; pictured), Slender Rush (Juncus tenuis), Lucerne (Medicago sativa subsp. sativa) and Alsike Clover (Trifolium hybridum). Turkish Tutsan (Hypericum xylosteifolium). Photograph courtesy of Mike Beard. Freshwater Sponge, Spongilla lacustris. Top: Specimen in situ. Photo: Mike Beard. 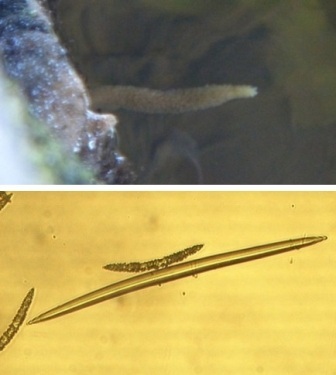 Bottom: Specimen under the microscope, showing the sponge spicules containing a megasclere and microsclere. Photo: Karen Evans. Vascular plants, birds, bees, dragonflies, butterflies, fungi, fish, amphibians, sponges, plus a few other invertebrate groups. Vascular plants of interest included local rariities like Unbranched Bur-reed (Sparganium emersum), Fennel Pondweed (Potamogeton pectinatus), Curled Pondweed (Potamogeton crispus), Ivy-leaved Duckweed (Lemna trisulca) and Gypsywort (Lycopus europaeus). However, arguably the most interesting find from the day was the freshwater sponge, Spongilla lacustris (pictured), which was identified by Karen Evans (University of Liverpool). Vascular plants, birds, fungi, butterflies, mammals, bees, bryophytes, lichens, moths and galls. We identified severally locally rare plants including Agrimony (Agrimonia eupatoria), Lesser Pond-sedge (Carex acutiformis) and Celery-leaved buttercup (Ranunculus sceleratus). 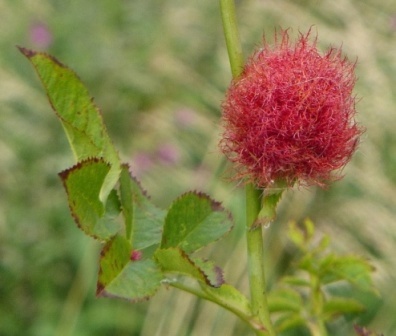 'Robin’s Pin-cushion' - a gall caused by the larvae of Diplolepis rosae. Photograph: Mike Beard.